So what came to mind when you read the word ‘Japan’? Perhaps nuclear accidents? Or sushi? Economic has-been? Japan is worthy of more considered reflection. I have recently had the opportunity myself to go beyond uninformed preconceptions to a more positive perspective. I would like to put Japan forward as an overlooked paradigm – as an example of how things could be. I have done this before with another initially less then prepossessing area: Thanet. I will begin by acknowledging the peculiarities and deficiencies of Japan (please note this is not meant to be an exhaustive survey). It is facing significant population decline – which in itself is interesting given that most of the discourse around population tends to focus on how there are going to be more of us on the planet. Some forecasts put the extent of this decline at really quite dramatic levels: a population which is two thirds of its current size in 2060. This leads into another facet of the country. Many other nations, when faced with the fact that there won’t be enough young people to work and support the old (there are limits to what robots can do), would boost the population with immigrants. However, this is not an idea which goes down well in Japan, where it is a point of pride that it remains a very homogenous people. This isn’t just a myth the country tells about itself – the figures back it up: under 2% of the population are foreign, compared to over 14% in the US. Another approach to stemming the population decline would be to encourage women to have more children, but this rubs up against other distinctive features of Japanese society. The idea of solo living – not even settling down, let alone delivering sprogs – is gaining popularity and social acceptance. In a distinctly conservative and buttoned down country, it’s one way for the younger generations to rebel and make it clear they want to do things their way. Another form of rebellion is dressing up. Have you heard of cosplay? It’s short for ‘costume play’ and what young Japanese do at the weekends. Time to think again about Japan. Let’s start with a quote from an article comparing the experiences of a traveller arriving in the US versus Japan. Now I will bring in words from James Hollow, another ex-WPP Fellow, who has been based in Tokyo for well over a decade, which challenge the idea that Japan is a ‘train-wreck’ economy as so often (and lazily) portrayed in Western media. GDP has been stable at more or less the same level it reached in the early 90s after the post war “economic miracle” and it is still the world’s third largest economy. Life expectancy has risen to lead the world (in contrast to the opposite trend in life expectancy in the US and elsewhere) largely through improvements in healthcare provision. Japan regularly tops academic quality-of-life studies that factor in prosperity, access to high quality services including but not only healthcare, diet etc. Japan has retained the relatively small wealth gap so important to a healthy, cohesive and robust society. Let’s go back to the idea of Japan as a paradigm. One of the more interesting ideas in the aftermath of the global financial crisis (that wasn’t simply about bashing bankers), was the idea that we should move away from an obsession with continuous economic growth and instead aim for prosperity without growth and living within our limits. Well, with its GDP averaging barely more than a couple percentage growth per annum during the past decade or so, as well its relatively small wealth gap (another vexed feature often associated with fast growing societies), I think Japan actually make a pretty good poster child for this idea. 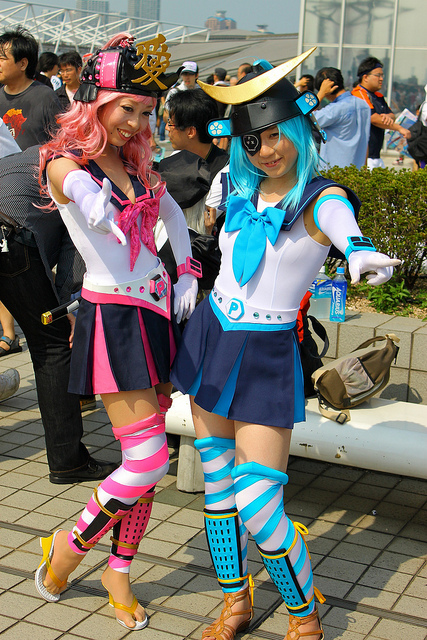 Let’s just leave out the manga-inspired outfits!